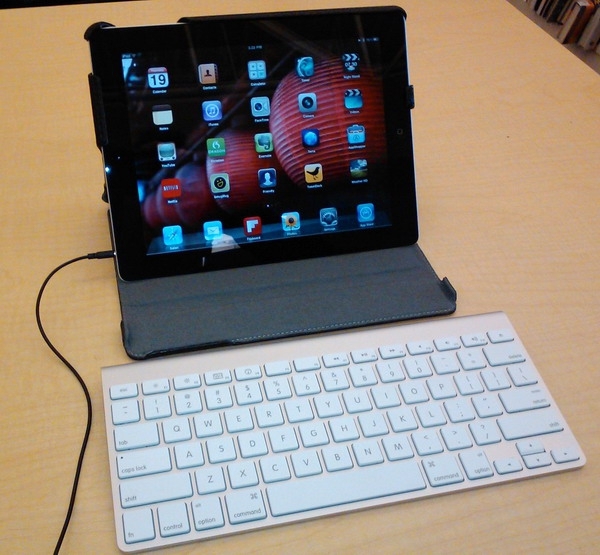 Last week I did something for the first time: I took my iPad 2, my Apple Bluetooth keyboard, and a pair of headphones - nothing else - and went to my local library to do some writing work. I've gone to the library to write many times before; if you're looking to get serious work done, it's a good idea to break up your routine and get away from your office, or at least the distractions that can hit you while there. Every time previously though, I've taken a laptop or a netbook. Taking my iPad was a first, and I have to admit I felt a little weird setting it up - it was easily the most lightweight, compact mobile workstation I've ever set up - it all packed up nicely in a Waterfield Design iPad Travel Express bag (watch for a video review soon). I set it up on a Marware CEO Hybrid iPad 2 case (another video review coming soon), fired up some orchestral music - listening to music with lyrics messes with my ability to concentrate if I have to read or write - and got to work. Here's where the reality of using a tablet hits you: as long as you keep your goals simple, it will work great. I was primarily brainstorming ideas for a presentation I was working on, so I ended up using the built-in Notes application. It's simple, but it's perfectly adequate for jotting down ideas as long as you don't care about formatting. If I really wanted to go all-out I might buy Keynote, the Apple PowerPoint-like app, but ultimately I knew I'd be doing the more complex work of assembling the slide deck back at a desktop computer. All in all, it worked really well - I cross-checked information I had in Evernote, kept up on my email, and because I was paranoid of data loss, I emailed my notes to myself every 15 minutes or so. In retrospect I could have done the note taking in Evernote and relied upon its cloud sync system to keep my data safe. The iPad is a very capable productivity tool if your needs are simple, and I didn't miss not having my laptop with me. If I were doing anything more demanding than note taking and brainstorming though, I'd very likely be wishing for a Windows-based laptop. Have you used the iPad, or another tablet, in productivity scenarios? How did it go?